Weekly Fishing Report - Top of the water is the place to be! There is nothing like the splash of a rising trout to raise the spirits of any angler. It encourages and re-energises the fisher, who being an optimist by nature, is ready to believe that the rise signals the beginning of an active feeding session by the trout and the hope of some rod bending action to come. The prevailing warmer conditions of the last week greatly increased the surface activity by fish anxious to tuck into tasty batches of flies coming off the water, so the angler had plenty of fish to target particularly in the morning and the evening when the wind had a tendency to drop. Taking advantage of the conditions was Paul Ingram who landed 15 fish on Black Ants, Black Klinkhammer and Olive CDC Shuttlecocks. Steve Prince on an all day session managed to bring 15 fish to the bank on a selection of Dry’s and Nymphs . M Wallace tempted 14 fish by the canny use of PTN’s , suspended Buzzers and Hare’s Ears and Charlie Miller & Garry Gormley both had 11 fish each using Buzzers, CDC’s and Hedgehogs respectively. The company formerly known as BT held their angling section day out at Lochter on Saturday and in a keenly fought contest Joe Campbell led the way with 13 fish on Buzzers the ever reliable Steve Argo was second with 10 fish on WSW and in third was Steve Williams with 6 fish on a Cat’s Whisker. Looking through the returns book , other notable efforts were A Ross who had 16 fish on montanas & buzzers, Fred McAlly with 14 fish , one being a nice brownie caught on CDC’s then various colours of fritz. Shaun Wilson with 9 fish one being a lovely 5lb specimen , all caught on Buzzers and Ian Falconer the esteemed championship winning angler had 9 fish on black PTN’s . 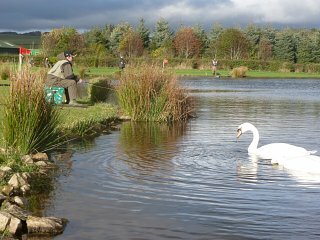 A reminder that the very popular September Singles Competition takes place at Lochter Fishery on Sunday 17th September. There are lots of prizes to be won and the entry fee is £20 which includes a splendid lunch . If you want to enter then please contact the fishery on 01651 872787 to put your name down.